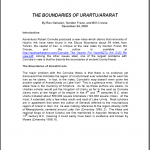 An Urartu/Ararat Geographic Boundaries paper was published by Rex Geissler, Gordon Franz, and Bill Crouse. Researcher and Northrup Grumman Engineer Tom Pickett died while diving near Key Largo on March 5, 2010. Tom was a wonderful man, a friend to many, and our sympathies go out to his family. Tom helped ArcImaging immensely and published much of his research online at The Genesis Files.